The release of the Josh Turner album 'I Serve A Savior' is already meeting with major success Stateside and showing that even when performing evergreen gospel songs like "Great Is Your Faithfulness", "Swing Low Sweet Chariot", "How Great Thou Art" (on which he duets with Sonya Isaacs) and "Amazing Grace" Josh's rich baritone voice and exemplary production can bring something very fresh to much-recorded songs. Josh was born on 20th November 1977 in Hannah, South Carolina. Growing up in the church he founded a gospel quartet called Thankful Hearts and later attended the Francis Marion University before moving to Nashville to pursue a career in music. In December 2001 Turner debuted at the Grand Ole Opry and sang a new composition, "Long Black Train". He received a standing ovation in the middle of the song and it turned out to be a key number which led to him being signed to MCA Nashville the following year. The song became the title track of his debut MCA album and was the second single released from the project. It became a huge hit and spent more than 30 weeks on Billboard's Country chart, eventually being certified Gold by the RIAA. Turner told The Boot that the song was inspired by a vision that he had of a long, black train running down a track in the middle of nowhere. Turner said, "I could see people standing out to the sides of this track watching this train go by. As I was walking, experiencing this vision, I kept asking myself, 'What does this vision mean and what is this train?' It dawned on me that this train was a physical metaphor for temptation. These people are caught up in the decision of whether or not to go on this train." Josh's second album, 'Your Man', released in February 2006, initially received lukewarm reviews from the critics, the Slant website even suggesting that Josh was in danger of becoming a "one hit wonder." Nothing could have been further from the truth and the lead-off single from the album became Josh's first number one hit on Billboard's Hot Country Songs chart and has now sold over 1,307,000 units. Turner turned his hand to acting and in 2008 played George Beverly Shea in Billy Graham biopic Billy: The Early Years. More albums followed: 'Everything Is Fine' (2007), 'Haywire' (2010), 'Punching Bag' (2012) and 'Deep South' (2017). But it's his latest 'I Serve A Savior' which is causing a flurry of excitement amongst Christians. He said, "My fans have been asking about this for a long time and I have been wanting to do this for a long time. The opportunity came along and it was the right time to do this. I made a mental list of the songs that I wanted to record and I decided to jump in with both feet." The song "The River (Of Happiness)" was co-written by his wife, Jennifer, and their eldest son, Hampton. "I was very pleased being able to jam on that. It's a song that my wife and my oldest son wrote together, and all four of my boys are singing on it. That song is a cool moment on the record." Sonya Isaacs of the successful Southern gospel group The Isaacs guested on two songs. Said Turner, "Sonya is great. It is awesome to have her on a couple of songs on this record. She is a very gifted singer and when she opens her mouth, you feel something automatically." Each day, Turner is motivated by his "love for music." "Sometimes, I have to pinch myself in the morning that I get to wake up and sing, write and perform country music, and now gospel music, for a living," he said. "I am living my dream. I am very blessed." I was so glad to get this write up on my google alert. 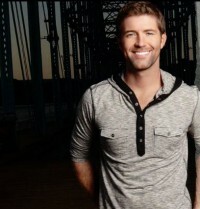 I have only known about/began following Josh Turner for 4 years, but he is my "pride and joy". I am so proud of his stand for the Lord over the years, his love for good music, and although I have been blessed to see him 2 X in concert, I hope for more. He is real, he is kiinda' "swimming upstream" in the country music genre, but being a wonderful , Godly man in the process. Thank you for this interview--I have given his new d.v.d./c.d. for gifts and will continue.